Our 100% online HAZMAT First Responder Awareness Level I (FRA) course helps workers meet the Initial or annual Refresher OSHA HAZWOPER training requirement per 29 CFR 1910.120(q)(6)(i). HAZMAT Awareness Training topics include: First responder awareness level requirements; hazardous materials, substances and wastes; recognizing and managing HAZMAT incidents; the emergency response guidebook (ERG); first responder actions and safety; and more. Our online HAZMAT First Responder Awareness Level I (FRA) course is designed to help workers meet the OSHA HAZWOPER requirement for HAZMAT First Responder Awareness (FRA) training. This course may be taken as either Initial or annual Refresher training. Training topics include: HAZMAT emergency response; OSHA first responder awareness level competencies; hazardous materials, hazardous substances and hazardous wastes; HAZMAT incidents; ERG training; FRA actions and responsibilities; and more. View a Detailed Course Outline below. First responders at the awareness level are individuals who are likely to witness or discover a hazardous substance release and who have been trained to initiate an emergency response sequence by notifying the proper authorities of the release. They would take no further action beyond notifying the authorities of the release. The most current version of the Department of Transportation’s (DOT) Emergency Response Guidebook (ERG) will be mailed to each student enrolled in this FRA course, as it is required for use during the course. A downloadable version of the ERG is also available to each student. Students who take the First Responder Operations FRO training are not required to take the OSHA First Responder Awareness FRA training. The FRO course meets the training requirement for both responder levels. With HazMat Student’s Online First Responder Awareness level course, our top focus is learning and student engagement. Through audio narration, visual text, relevant photos, and interactive quizzes, students are able to complete the course with the knowledge and retention needed to pass the course and for use on-the-job. Students also are provided with a downloadable course manual for current and future reference and note-taking. See the adjacent sample page from the student manual. This FRA level training course may be taken as either Initial or annual Refresher training. It can also be taken for EMS Continuing Education (CE) credits for an additional $5. The desired course option must be chosen during enrollment. Purpose of Hazmat training | Hazmat incident occurrences and locations | Emergency response HAZWOPER regulation | Hazmat emergency responder training levels | Emergency Response Plan (ERP). Awareness level first responders (FRAs) | OSHA FRA required competencies | FRA required training | Types of FRAs | Differences in FRA experience. OSHA, EPA, and DOT definitions | Hazmat training differences by agency. 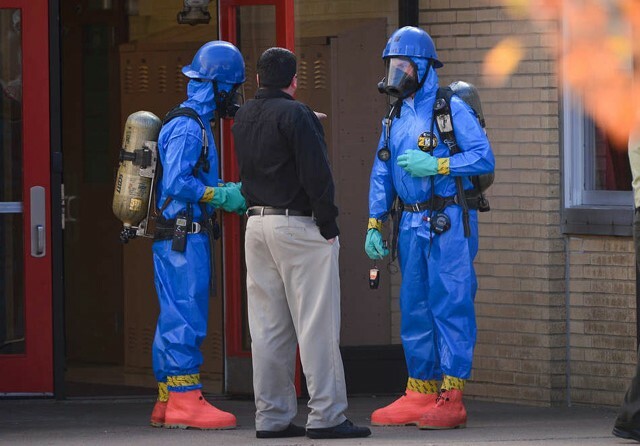 Hazmat response initial steps | Recognition of markings, container shapes, witness descriptions, DOT placards and labels, and pipeline markers | Suspected hazmat presence. ERG background and contents | ERG 2012 – Physical book and download | OSHA ERG training requirement | ERG white pages. Use, overview, and examples | Violent polymerization materials | Toxic inhalation hazard materials. Safety recommendations | Guide titles and layouts | Potential hazards | Public safety | Emergency response. Toxic inhalation hazard (TIH) | Isolation and protective action distances | Water reactive materials. Hazmat incident management | Incident Command System (ICS) | NIMS | Command staff. FRA hazmat response | FRA safety | Hazards and risk assessment | FRA actions. First responder safety | Capabilities | Emergency response plan | Additional training. An understanding of the role of the first responder awareness individual in the employer’s emergency response plan including site security and control and the U.S. Department of Transportation’s Emergency Response Guidebook. Designed by Certified Outreach Trainers, this OSHA First Responder Awareness online course includes up-to-date, high quality training students complete using our state-of-the-art Online Training System (OTS). The course features interactive training modules, which combine audio and visual elements for maximum retention. The HAZMAT awareness training course is completed entirely online using a computer with an internet connection and is available 24/7. For your convenience, it can be completed over time, and your progress will be saved to the last section completed. Students are given 6 months to complete the course after enrollment. We are so certain you will be satisfied with your experience, that we offer a 100% Money Back Guarantee*. This course includes 3 exams. One exam must be taken at the completion of each module. This online First Responder class consists of 3 modules and 15 sections which students complete through our Online Training System (OTS). The sections are fully narrated and interactive. Quiz questions within each section help the student retain knowledge that will be needed for the module exams. Our online HAZMAT First Responder Awareness Level training course was designed by OSHA Certified Outreach Trainers. It is OSHA accepted and meets the requirements for 29 CFR 1910.120(q)(6)(i) for general industry and 29 CFR 1926.65(q)(6)(i) for construction. Please note that this course provides valuable HAZMAT First Responder Awareness Level I training information which applies to a general population of employees. This course is not meant to replace company-specific or function-specific training provided by your employer on equipment use and procedures for your particular work environment. You must be trained by your employer on the hazards, equipment, engineering and administrative controls, safe work practices, policies and procedures and emergency plans specific to your role and workplace.